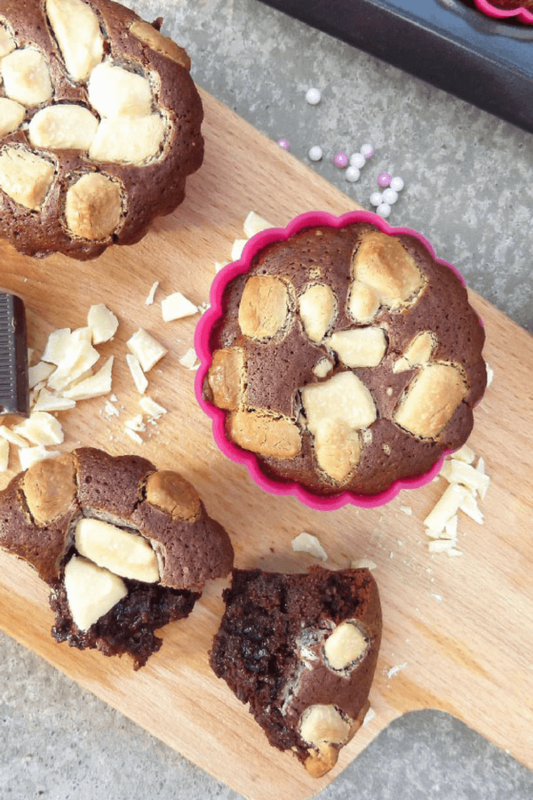 These ooey, irresistibly gooey Nutella kladdkaka muffins are a dream. Nutella is not something I often have in my house. My kids go crazy for it, but I am not too keen on the horrible list of ingredients it has. Sometimes, I get past this by making my own hazelnut chocolate spread, but the kids don’t always buy that (tricky buggers). However, although I know Nutella is not the best thing we should be putting in our mouths, I do think it adds a little something to baking, and everything in moderation. So, when one of my favourite students (I am an English home-language teacher) begged me to make him some Nutella muffins, I bought a jar. 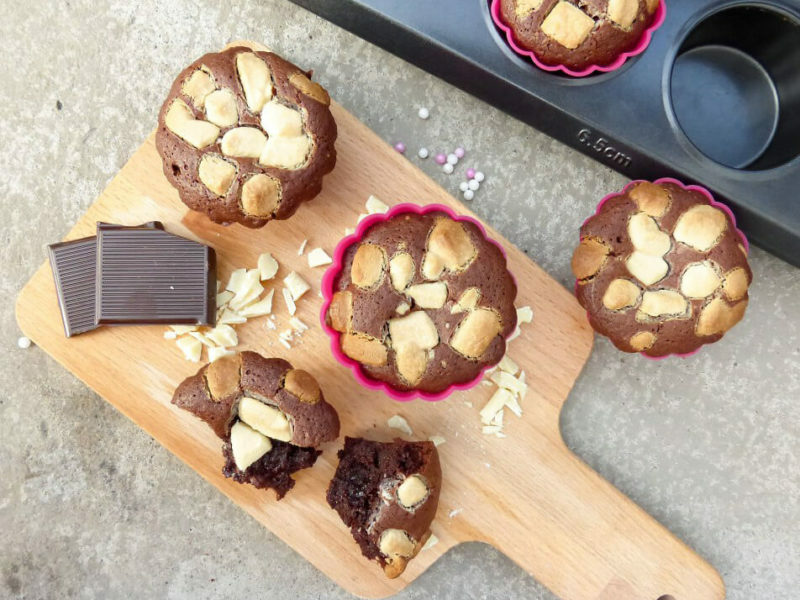 The end result was these crazily delicious triple chocolate gooey Nutella kladdkaka muffins. If you’ve never been lucky enough to come across a kladdkaka (you need to rectify that immediately), it is one of Sweden’s favourite desserts. How you enjoy your kladdkaka can split a family apart. It can be baked so that it is similar to the texture of a brownie (like my fudge version), or slightly under-baked causing a very gooey, soft centre (like this gorgeous lemon one). How do you fancy yours? So, not only do these have Nutella in the batter, there is also a dollop in the centre. In addition, they have melted dark chocolate and a massive sprinkling of white chocolate over the tops. 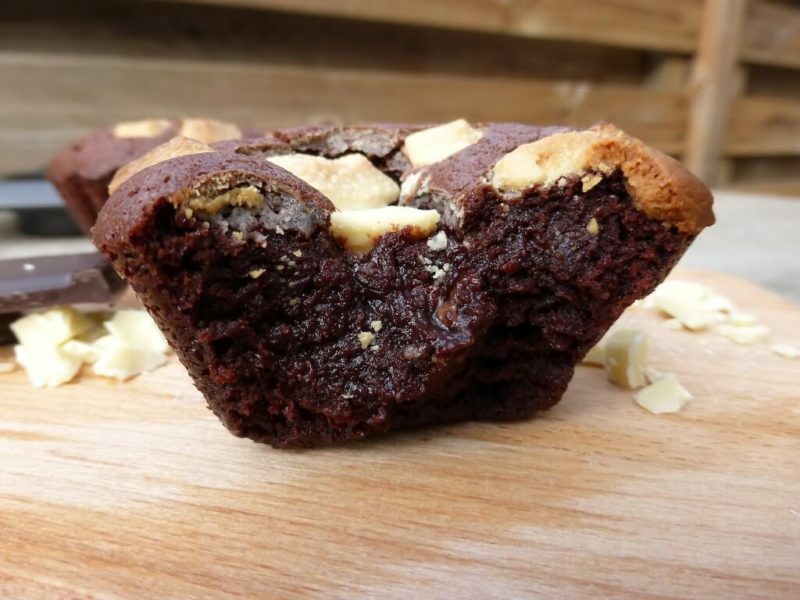 So really, perhaps they should be called “quadruple chocolate” muffins, instead? Like all my recipes, these are simple and quick to make. The hardest bit is melting the chocolate. The ingredients below made five large muffins. They don’t rise (other than egg there are no raising agents, making them dense, just as kladdkaka should be), so you can fill them almost to the top of the cases. Eat them straight out of the oven to appreciate their gooiest best (dollop some vanilla ice-cream on top for good measure), or eat them when they’ve cooled and firmed up a touch. Win, win, either way! ~ Pre-heat the oven to 350°F (175°C). Prepare a muffin tin or cupcake cases. ~ Gently melt the chocolate, Nutella and butter in a Bain Marie (double-cooker) and add in the brewed coffee. Allow everything to melt completely before quickly whisking until it is nice and thick. Set to one side. ~ Whisk the egg and sugar together until nice and fluffy. Add the chocolate and continue to whisk until well combined. ~ In a separate bowl, combine the flour and cocoa and then fold into the wet ingredients. Don't overmix, but make sure everything is well incorporated. ~ Pour half way up your muffin cases/moulds or tin (I used silicone muffin cases) and then add one teaspoon of Nutella on top of each one. Cover with more cake batter until almost to the top (the cakes will not rise a huge deal). 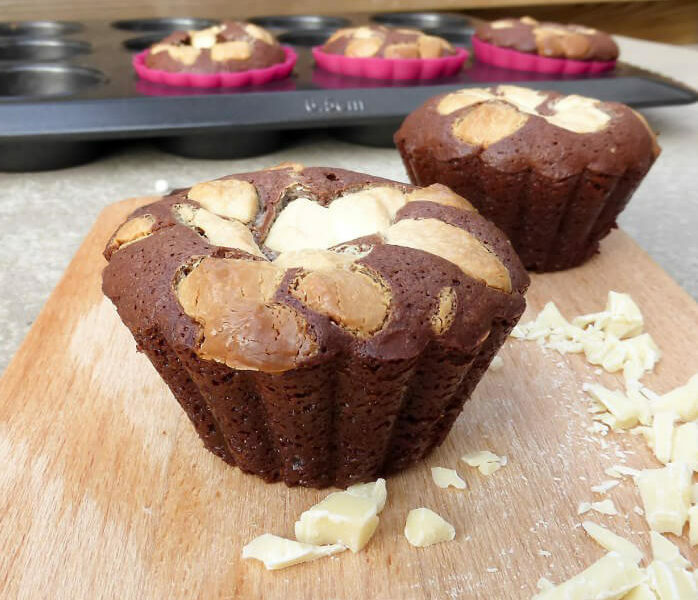 If you use smaller cupcake-sized muffin cases, you will be able to make more, so just add one teaspoon of Nutella to every cake you make. ~ Sprinkle with tons of huge chunks of white chocolate and then bake for round 13-15 minutes (don't overbake or they will be dry! ), just until an inserted skewer/toothpick comes out clean. ~ Remove from the oven and eat almost immediately (let them cool a little to prevent accidents!) and serve with some vanilla ice-cream. Or let them cool completely and enjoy cold!